The 3D master technology for a paperless production based on 3D CAD models is supported also by new standard formats like STEP AP 242 and JT. The software manufacturer CoreTechnologie has fully integrated the advanced 3D master technology in its tools. The German-French software manufacturer CoreTechnologie has integrated the advanced 3D master technology in its tools. Native CAD models including dimensions and tolerances can be converted and also displayed with all specific functions of the model based definition technology. The use of 3D master is reducing the need for 2D drawings to an absolute minimum, because in the 3D model all production-relevant information is saved in so called views or captures. 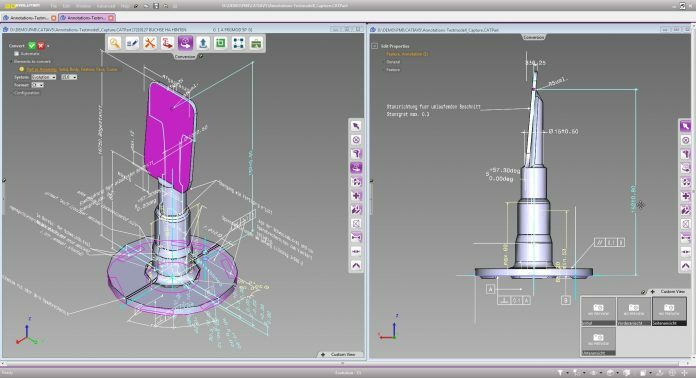 The 3D_Evolution software converts data from all CAD systems including 3D master relevant formats such as Catia V5, NX, Creo as well as STEP AP 242 and JT. The viewer software 3D_Analyzer developed by CoreTechnologie reads all current CAD data and also supports all 3D master specific functions. To display all the information contained in the 2D drawing on a 3D model requires a special technology that combines tolerances, annotations, and dimensions in the views. By selecting a view, the model is aligned as previously defined by the designer and zoomed into a particular area. So only the dimensions chosen by the designer are shown. In addition, sections can be saved in the views. As a result, 3D master models eliminate the need for 2D drawings to produce the part. Also, 3D master models are easier to use and allow for a better comprehension compared to specific views created and printed out as 2D drawings. In addition, using 3D master there is only one data source needed to produce the parts which virtually eliminates errors and confusion often caused by different revisions of ambiguous 2D drawings. The 3D_Evolution CAD converter suite transfers the graphical representation of the dimensions as well as the semantic, i.e. textual data of the Product Manufacturing Information (PMI) as well as the reference to the surfaces to the 3D model. A special analysis function available in the converter and the viewer allows the comparison of the PMI, so that even large models with hundreds of 3D dimensions are automatically compared within seconds and differences are clearly visible and documented. This comprehensive software solution from CoreTechnologie meets all the requirements for a consistent 3D master process. The cost-effective viewer can be installed on a Windows tablet for use in the workshop and can be used flexibly in company networks or on the go thanks to floating and license borrowing functions. Since its foundation in 1998, the software manufacturer CoreTechnologie with locations in Germany, France, USA, Japan and Great Britain has been led by the managing directors Dominique Arnault and Armin Brüning. With innovative products, the visionary company has consistently optimised its product portfolio and secured the technological leadership in the area of conversion software. Each year, CoreTechnologie invests more than 30 per cent of sales in the research and implementation of new technologies and has the most complete product range in this field. In the focus of technology development is the product line of “3D Evolution” which guarantees efficient and lossless exchange of complex data structures between independent and heterogeneous CAX software solutions. With extremely powerful native interfaces for all leading CAD systems and for conversion of all common 3D formats, the software module ensures optimal interoperability of most various IT solutions. Apart from providing visualisation and manufacturing data across most various systems, CoreTechnologie offers outstanding technologies for automatic data correction, feature-based conversion, geometry optimisation, quality control and long-time archiving as well as for visualisation of complex 3D models. The software components for software manufacturers of the most different CAX applications are the company’s second leg. The customer portfolio of CoreTechnologie comprises more than 400 companies from the automotive, aerospace, engineering and consumer goods industry who are in many cases the quality leaders in their relevant segment.